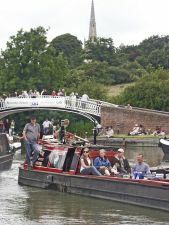 Raising funds and awareness of this important project is vital for the progress of the Canal’s restoration. Our Sales and Information Stand can be seen at many Waterways and Country Shows during the year. We have two small teams of volunteers based at Hereford and Gloucester to cover both local and national events. Come and visit, or better still, join us on the stand? Why not have a good day out with the H&G CT? We cannot promise that you will see the world with us but you may visit an area that is new to you – and we always do our utmost to ensure that you have some time to look around (and your admission to the event will be free! We urgently need additional volunteers to help us at these interesting events. Our small but well-established teams will make you very welcome! Please contact us to discuss where and when you can get involved.